Unfortunately time constraints (i.e my day job) keep getting in the way of me updating this site so all Ive been able to do so far for the Hull City Nickname page is a very basic bit of background. 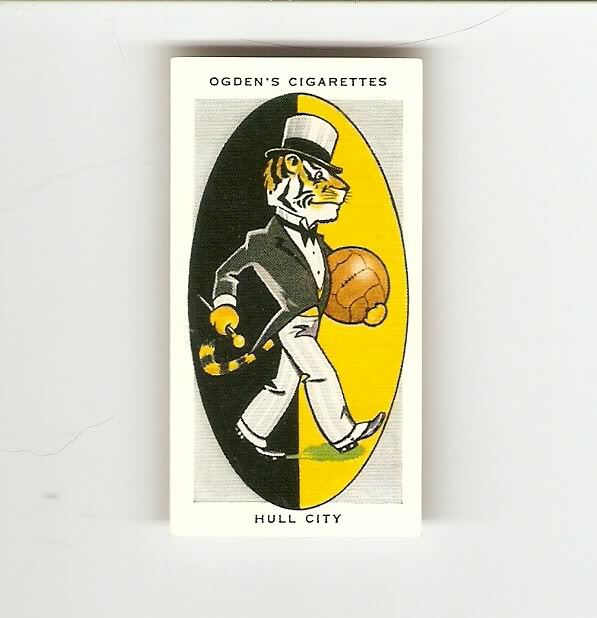 Ive shown below a football cigarette card from the Ogdens AFC Nicknames series that features a Tiger with a football which of course depicts Hulls "Tigers" nickname !! "Hull City first appeared as a Second Division club in 1904. On this occasion they were at once called the “Tigers” from their amber and black vertically striped jerseys and have continued to be known by this name. Hull has always been a strong centre of Rugby football, but on its introduction the new game became popular and an encouraging measure of success was gained. “Boy Browell”, a sixteen year old centre forward who afterwards went to Everton and Manchester City, was one of the leading players in the early days. The club fell out of the Second Division, but regained promotion to this competition in season 1932-33". So there you are, a very brief overview of Hull Citys nickname, theres a bit to expand on yet though so Ill be coming back to this page shortly.